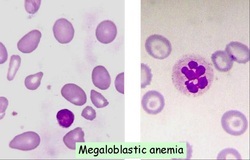 Megaloblastic anemias are caused by vitamin B12 deficiency and folate deficiency. Vitamin B 12 deficiency may present signs and symptoms such as diarrhea, glossitis, neurological difficulties ( impaired vibration sensation, impaired proprioception and ataxia ) and autoimmune gastritis. Vitamin B12 deficiency may caused demyelination of the posterior and lateral column of the spinal cord. Vitamin B12 deficiency is caused mostly by autoimmune gastritis due to the failure in the production of the intrinsic factors. Other caused may include resection of the gastric/stomach, malabsorption syndrome sufferer, ileum resection and vegetarian diet. The investigation may reveal the present of anti intrinsic factor antibodies, decreased hematocrit, positive result while performing Schilling test. Schilling test is useful to detect malabsorption of the oral vitamin B12. Peripheral blood smear/ blood film may reveal macrocytic erythrocytes, pancytopenia and hypersegmented neutrophils. The treatment for vitamin B12 deficiency may include supplementation of the intrinsic factor in case of anemia related autoimmune gastritis and vitamin B12 supplement. Another major cause of megaloblastic anemia is folate deficiency. Patient who suffer from folate deficiency may complain of diarrhea and glossitis. The common causes of folate deficiency are pregnancy, intake of drugs such as phenytoin, sulfa drugs and methotrexate, alcoholics, malabsorption syndrome and dietary deficiency. Laboratory findings may include decreased in the red blood cell folate level and decreased in the hematocrit. Peripheral blood film/peripheral blood smear may reveal macrocytic erythrocytes, pancytopenia and hypersegmented neutrophils. The treatment of folate deficiency may include folic acid supplementation. 1.R, Oh, and Brown Dl. “Vitamin B12 Deficiency.” American Family Physician 67, no. 5 (March 2003): 979–986. 2.HERBERT, VICTOR, RALPH ZALUSKY, and CHARLES S. DAVIDSON. “Correlation of Folate Deficiency with Alcoholism and Associated Macrocytosis, Anemia, and Liver Disease.” Annals of Internal Medicine 58, no. 6 (June 1, 1963): 977–988. doi:10.7326/0003-4819-58-6-977.